SIOUX FALLS, S.D. – Mike Willard, Colton, S.D., judged the Sioux Empire Farm Show Limousin Show Jan. 29 in Sioux Falls, S.D. Willard chose lot 11, Master BRUN LL 2483A, a consignment from Bruner Limousin, Inc., Winfred, S.D., as champion bull. He was sired by Master BRUN Redfrost 2117Y and out of Lady BRUN 2201Y. He sold to Jeff Younie, Alpena, S.D., for $4,500. 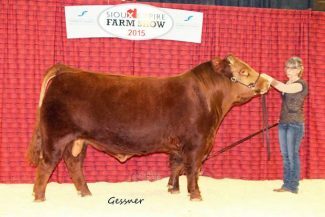 Reserve champion bull went to lot 8, SYES Accolade 644A, a consignment from Symens Bros. Limousin, Amherst, S.D. He was sired by WULFS Urban Cowboy 2149U and out of Miss DLVV Ladys Man 640R. He was one of the highest selling bulls and sold for $5,500 to Leon Etzkorn, Pierre, S.D. Six bulls sold for $5,500 including consignments from Lura Limousin, Symens Bros. Limousin, Devitt Limousin and Nolz Limousin. Willard chose lot 1, ROMN Black Betty 15B, a consignment from ROM'N Limousin, Arlington, S.D., as champion female. She was sired by DHVO Trey 133R and out of ROMN Tutu 40T. She was the highest selling female selling for $9,000 to Jim London, Freedom, Okla.
Willard chose lot 2, Lady BRUN Jetta 2653B, as reserve champion female. She was consigned by Bruner Limousin. She was sired by Master BRUN Guru 2288Z and out of Lady BRUN 895S. She was the second highest selling female selling for $3,100 to Ryan Riemer, Marengo, Wis.
Chisum Peterson, Pukwana, S.D., served as auctioneer for the Limousin Sale. He auctioned nine bulls and two females. Nine bulls averaged $5,027.78, and the two females averaged $6,050.